Japanese Prime Minister Shinzo Abe’s visit to the U.S. has achieved one main goal for Japan: a deepening of the U.S.-Japan security alliance. The biggest change is the new joint defense guidelines now allow Japan’s military to fight alongside the U.S. military anywhere in the world, as long as Japan deems it necessary for Japan’s national security interests. On the surface, such a move might strengthen Japan’s security, particularly during China’s rise in Asia. It might also increase the odds of the U.S. coming to aid Japan militarily since now Japan is ready to help the U.S. anywhere. A closer analysis, however, reveals that a deepening U.S.-Japan alliance might actually hurt Japan’s security interests. To start with, a possible global presence of Japan’s military will involve Japan in unnecessary conflicts in some dangerous quarters of the world. The U.S. is a superpower with security interests in every corner of the world, but Japan is not a superpower and hence does not have security interests globally. Also, in the past 15 years, the U.S. has fought two very costly, yet unnecessary, wars in Iraq and Afghanistan and now is probably entering a new war in the Middle East and even Ukraine. If the United States decides to send ground troops to fight ISIS or help Ukraine fight Russia, how should Japan help? And can Japan really help? Of course, Japan can provide some logistical assistance, but real military assistance involving Japanese soldiers would be highly risky. Already, two Japanese citizens were beheaded by ISIS for Japan’s close relationship with the U.S. in fighting the ISIS. Japanese involvement in the United States’ conflicts could lead to greater suffering for Japanese citizens. It might be the case that Japan, under the leadership of Abe, wants to use these new guidelines as an opportunity to revise its constitution and make Japan a ‘normal’ state again. Japan becoming a ‘normal’ state is actually a good thing, and other countries should welcome it. But becoming a military machine that closely follow America’ s every step or misstep around the world is not a good thing for Japan. Instead, Japan should aim at an independent foreign policy that centers around its Asian neighbors instead of the whims of U.S. foreign policy. Only through this approach can Japan and other Asian powers build a peaceful and prosperous Asian community. A more serious problem is Japan’s intended target in Asia. Although unstated, everyone knows that the real target of the U.S.-Japan security alliance is China. A new disturbing development is that Japan and the U.S. may start joint maritime patrols in the South China Sea, with an aim to counterbalance China’s growing presence there. This is a puzzling move on Japan’s part. There is already a high chance of an accidental clash of plans and vessels between China and Japan in the East China Sea—why risk another clash with China in the South China Sea? Plus, Japan is not part of any South China Sea disputes, so why does Japan want to be dragged into the already very complex situation? Perhaps the pressures come from the United States, and perhaps Japan sees a good opportunity in mobilizing smaller Southeast Asian states to balance against China. Whatever the motivation, Japan’s move is a highly risky one and it would only lead to higher levels of tensions between Japan and China. In the realm of international politics, action begets reaction and a new alliance invites a counter-alliance. 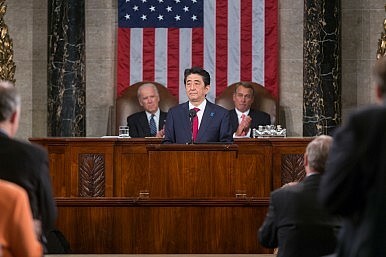 So we now have a stronger and firmer U.S.-Japan alliance, what will China do? The most likely case is that China will counteract the U.S.-Japan alliance with its own alliance with Russia (most likely). Already, because of America’s strategic mistakes in Europe, Russia is quickly moving closer to China, both economically and politically. It is no longer unthinkable that we might see a China-Russia alliance in the near future, particularly if the U.S. and Japan increase their pressures on China. If indeed someday that happens, we might enter a ‘new cold war’ in Asia—real bad news for everyone. In the end, the best strategy for Japan is to come to terms with China’s rise and cooperate with Beijing to build a better regional order. This certainly does not mean that Japan should cave to China on every issue. There are real differences between these two giants in Asia, and China is not necessarily right on every issue. It won’t be easy, but let us hope wise minds in Japan will prevail. In uncertain times, Japan will have to invest more energy in a long-standing partnership.